Did you know that 400,000 deaths each year are caused directly by cigarette smoking? Someone will die from smoking by the time you finish reading this page. 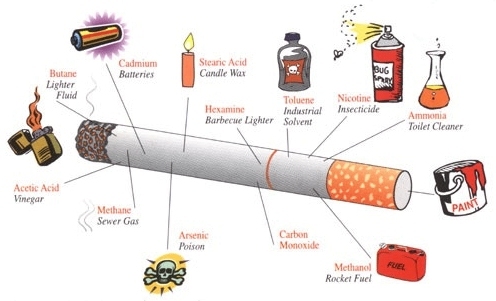 What's in regular tobacco cigarette? More than 10,000 non-smokers will die this year due to tobacco use -- over 1000 lung cancer deaths and at least 3000 deaths from coronary heart disease will be caused by second-hand smoke. Tar coats your lungs like it does the roads. A 20-a-day smoker breathes in a mug full of tar every year. Tar damages the hairs that clean the lungs and it inflames the air sacs. Mucus builds up and this results in the smokers' cough. Eventually it causes bronchitis and emphysema. It also yellows the teeth, hands and skin. Carbon Monoxide robs your brain, heart and muscles of oxygen. Carbon monoxide combines with nicotine to thicken the blood. This can cause heart attacks and stokes, blood clots in the limbs and amputation. 3 out of 4 deaths from heart attacks in men are due to smoking. 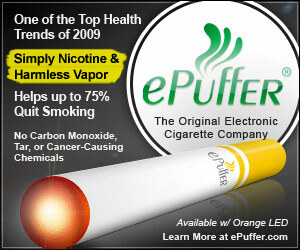 What’s ePuffer Electronic Cigarette ? ePuffer Electronic Cigarette performs similarly to traditional smoking. It looks, feels and tastes like a cigarette or cigar, and delivers all the pleasures of smoking, without all the problems. The secret to what makes the Electronic Cigarette better than traditional smoking is what is inside this revolutionary new product. The non-flammable Electronic Cigarette is driven by modern microelectronic technology, a small rechargeable battery and a unique, safe replaceable cartridge containing water, propylene glycol, nicotine, a scent that emulates a tobacco flavor and a membrane to suspend the ingredients. When using the Electronic Cigarette, the act of inhaling or smoking it produces the tactile and craving satisfactions traditional smokers seek, and triggers a vaporizing process that releases a simulated smoke that is actually a vapor mist that harmlessly evaporates into the air within a few seconds. Why I Choose ePuffer instead of the traditional cigarettes ? Smoke it anytime, anywhere; not banned. Costs less than tobacco smoking. With rechargeable batteries. Tastes like tobacco, but contains no tobacco. No carcinogens (safer than tobacco smoking). Virtually odorless; no lingering smell in clothes, home and car. Replicates behavioral and physical pleasures of smoking. Easy to use (doesn't require matches, lighters or ignition). Won't stain your teeth and damage your skin. No more embarrassment or guilt.